Mathematical Analysis and its Applications covers the proceedings of the International Conference on Mathematical Analysis and its Applications. 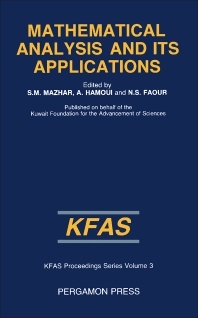 The book presents studies that discuss several mathematical analysis methods and their respective applications. The text presents 38 papers that discuss topics, such as approximation of continuous functions by ultraspherical series and classes of bi-univalent functions. The representation of multipliers of eigen and joint function expansions of nonlocal spectral problems for first- and second-order differential operators is also discussed. The book will be of great interest to researchers and professionals whose work involves the use of mathematical analysis.